Sgt. Reuben W. Reed, son of Mr. and Mrs. S. C. Reed, attended school in Weaver and Henderson. Entered Marines in Jan., 1939 trained in San Diego, Cal. 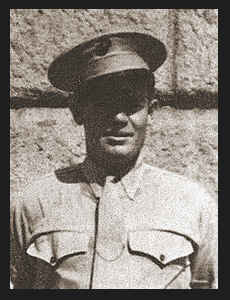 ; served in China, the Philippines and Australia; has been missing in action since Feb., 1942. Awarded Good Conduct Medal. (as per original 1940's publication.) The correct name of Sgt Reed's parents was added by family as Mr and Mrs. John Wesley Reed and we thank them for this correction.